I don’t know about you, but I HATE going to the gym. As a former gymnast and cheerleader, working on machines and lifting weights has never been my thing. Even though I was never the best gymnast on the team, I was still up for the challenge that each new skill brought. I also loved taking what I knew from gymnastics and incorporating that into cheerleading and vice versa. As high school ended and college began, I found myself doing absolutely nothing physical. Other than the occasional racquetball with my friends or stroll around the LSU lakes with my zistas, I found myself struggling to engage myself with physical activity. 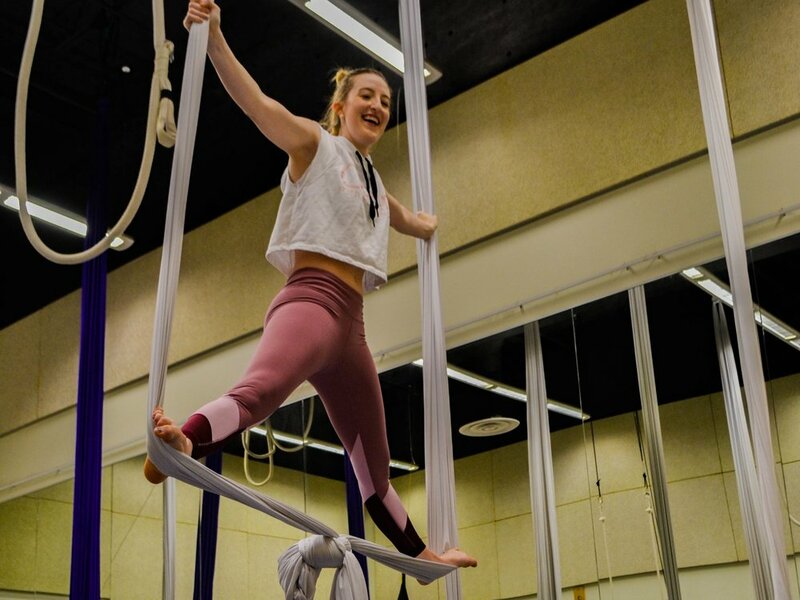 That is, until my final semester when I decided to branch out and try LSU’s THTR 2031 class: Aerial Silks Practice I. Other than seeing a video here and there, I had NO IDEA what Aerial Silks was! Essentially, it’s a kind of acrobatic technique using industrial grade fabric that hangs from the ceiling that allows the aerialist to climb up and wrap themselves in it in order to do certain skills. That sounds so intense at first, and I really did not know what I was getting myself into. Little did I know that it would turn out to be one of the greatest decisions I have ever made. After signing up for the class, every person must go through an audition with the professor to make sure you are strong enough to perform well in the class. I auditioned and I passed, but I knew there was a lot more ahead! I was so sore after my audition, it motivated me to condition throughout the winter break in order to prepare my body a little bit more for the class. Just one week into the class and I was overjoyed. I was using muscles and flexibility that I have not used since gymnastics! On the silk, I do not feel like I am working out, but performing some kind of dance or act. I go to the gym just so I can get stronger on the silk. This is also the only class I have ever attended 100% because I am just so engaged and excited each and every day to go. Every single person in the class is so supportive and energetic that the entire environment is conducive to succeeding. Not only has silks given me a reason to get fit again, but it has also helped me so much emotionally. Like many others in college, I was diagnosed with depression and panic attacks in between my freshman and sophomore years at LSU. While I have been getting so much better the last couple of years, I think silks has really showed me what it can do for my mental health. More days than not, I am feeling good. Some days I even feel great! 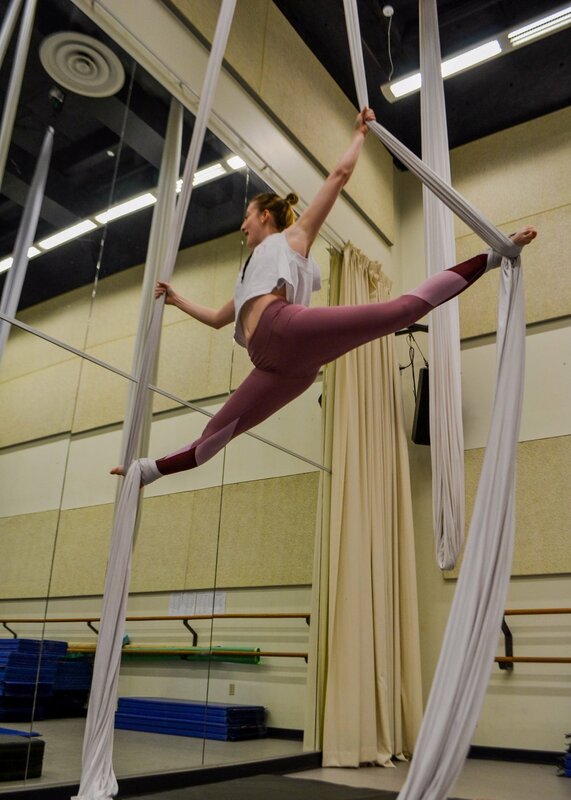 I also think aerial silks has boosted my confidence in general. Throughout the class, each person is required to perform two solo quizzes and one final solo performance. I have never really been one to be in the spotlight alone, but silks gives me a reason to. I love sharing with people my performances and surprising them with skills they never knew I had! It feels really great to be good at something again! I see myself taking aerial silks into my future because it has really become such a light in my life.